← 18th Century Inspired Riding Habit Done! 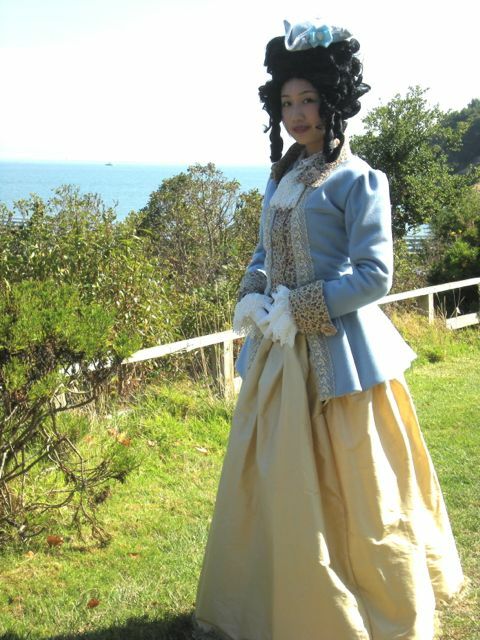 Yesterday I attended an 18th-Century themed picnic hosted by the Greater Bay Area Costumer’s Guild. I wore my recently completed wool riding jacket. It was in Tiburon, California. It was a beautiful day with a wedding nearby. Some of the guests occasionally wandered over to ask us what we were doing. I was wearing my new silk clocked stockings from American Duchess. My leather shoes and reproduction buckles are also made by her. 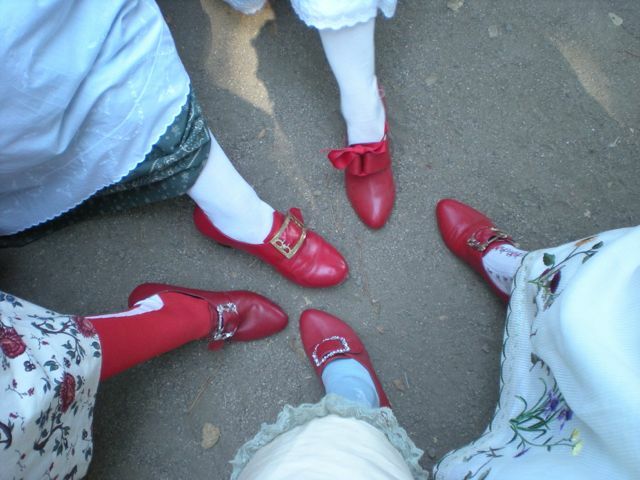 The shoes are very popular in our local costuming group. I found 5 of us wearing red ones at the picnic! I ran short of time to make or find a “hedgehog wig” used in the late 18th century so I modified my old Marie Antoinette tall poufy wig from last Halloween. Since it’s hollow inside I squished it down, held it in place with black bobby pins and sprayed it with dry shampoo to reduce the shine. Posted in 18th Century and tagged 18th century, 18th century riding habit, costume, sewing. Bookmark the permalink. Your costumes are both beautiful and inspiring. To see the details up close and visualize the possibilities for costume descriptions I had never thought of was great. Long ago, I was the costume mistress for a children’s ballet company and did over 100 costumes for a musical stage version of Cinderella. I am just now finishing up editing and proofing my historical romance novel set in 1789 and 1790, first in opening in Yorkshire, England, then journeying south to a beautiful Devon-shire estate and Dartmoor, before sweeping across the South Atlantic to the great tropical plantations and ranches of Colonial Brazil, and finally closing with a return visit to England. The costuming combinations and possibilities are practically endless, yet I like to envision each detail of my characters’ dress, it reflects their taste and personalities and emphasizes their position in society. I originally sewed most of the costumes my characters would be described wearing in miniature, using various likely looking Barbie Doll as my models, not having anywhere near the budget it would take to sew the full sized versions, no matter how wonderful it would be to attempt all those lovely costumes. I did purchase a large bolt of authentically patterned fabric from Jas. Townsend and Sons, and will be attempting to sew a lovely cotton Polonaise gown from the beautiful printed floral fabric. Their shop, only twenty minutes from my home, is full of interesting 18th century items, and they are friendly and helpful if asked about historic details of the period. I fell in love with your lovely costumes and look forward to seeing many more in the near future. Thank you for the inspiration! Thank you Cynthia! Your projects sound wonderful. If you have pictures of your tiny costumes I would love to see them. Good luck on the novel!